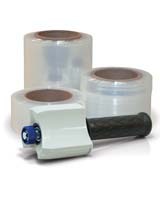 Stretch wrap and/or stretch film are a stretchable plastic film that is wrapped around items and pallets. 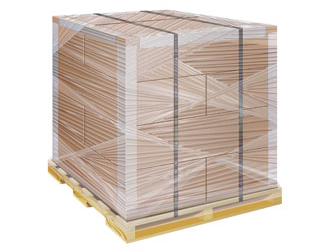 Stretch films elastic properties keep items tightly bound together for packaging, shipping, and storage. 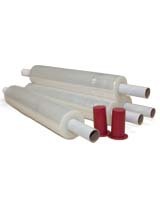 Economical polyethylene hi-clarity hi-cling stretch wrap film is offered as bundiling stretch film, hand stretch film, extended core stretch film, and machine stretch film rolls. Our stretch wrap features superior break strength, cling, clarity, tear resistance not found in other stretch film. 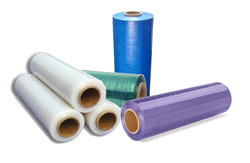 Extruded or cast polyethylene stretch film and stretch wrap is available depending on your stretch film need. Ideal for use in any business that receives and deposits large amounts of cash money. Use a hand stretch wrap film dispenser to apply film by hand. Gauges of 60, 70, 80, 90 and 120 and widths of 12" to 18" are in stock. Comes with a disposable extended core for easy grip. Many sizes and gauges available from 80 - 120 gauge. 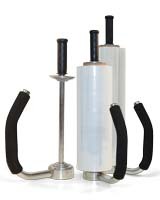 The 3" core fits most any reusable hand-held stretch wrap dispenser. Choose from gauges of 60, 80, 90, 135 and 150 that are in stock.